What’s more romantic than lingering over a delicious meal with someone you care about? Whether you’re cozying up to someone new, or reigniting the spark with an old flame, here are seven spots in Seattle that prove sharing is caring. Mention sushi chef Shiro Kashiba’s name to locals, and you’ll hear nothing but gobs of praise. And it’s well earned. As he trained under the legendary Jiro Ono of “Jiro Dreams of Sushi,” Kashiba turns out nothing but spotless Edomae-style sushi. (Meaning: no avocado, spicy mayo, or bizarre rolls in sight.) Really, the only way to go is to bypass the menu and order the omakase. Sit back and trust Kashiba and his capable team to guide you to what’s freshest and most flavorful. They won’t let you down. When the weather’s right, reserve a couple Adirondack chairs in the outdoor patio, and face the rippling water and blue skies with some rosé, local oysters and Steelhead caviar, which arrives with house made chips, pickled shallots, and crème fraîche. But if the weather’s looking gloomy, as Seattle weather often does, you’ll be equally happy to retreat indoors. The cheery, nautical-themed restaurant is such a looker, it was nominated by the James Beard Foundation for outstanding restaurant design. It’s one of Seattle’s most historic restaurants – the swanky steakhouse opened in 1953, closed in 1985, then reopened in 1996 – and remains one of the most beloved for a romantic night out. 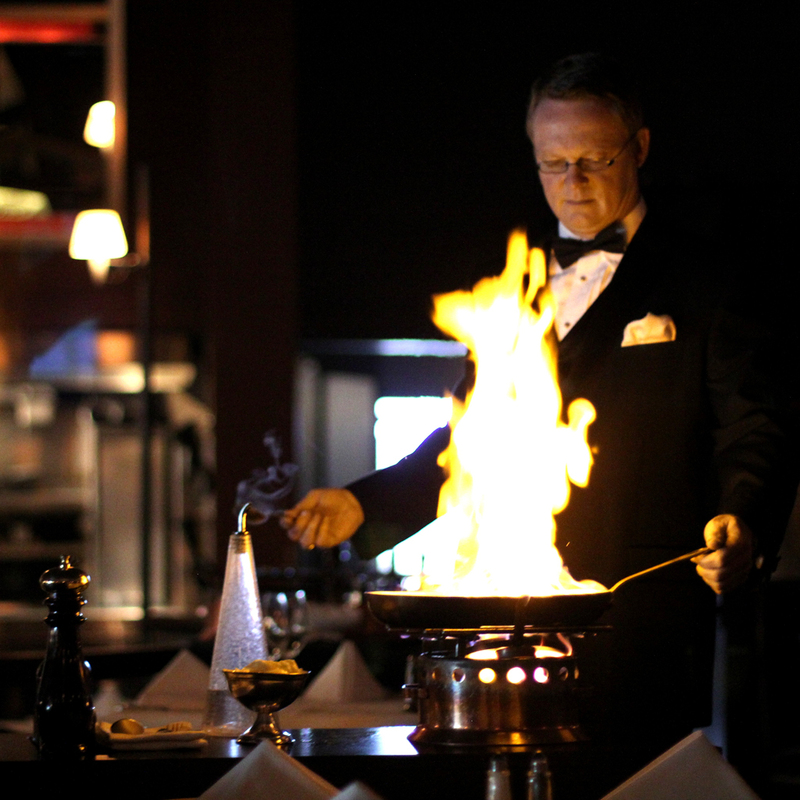 An evening here feels like dinner theater, as tuxedoed servers wheel around carts for tableside salad and flambéd desserts, and zip through the dining room with flaming swords of 28-day dry-aged beef. Nightly live jazz completes the thoroughly delicious and fun experience. Grab seats at the bar to watch all the action. Husband-and-wife chefs Rachel Yang and Seif Chirchi work side-by-side and turn out wildly addictive Korean-inspired dishes, from pork belly pancakes to short rib rice bowls. And order the fennel kimchi. Because after one bite, you’ll wonder why no one thought of it before – it’s that good. As with all of Yang and Chirchi's restaurants, Revel embodies a “come as you are” mentality, so pop in for a drink, or linger all evening. After calling 12th Avenue home for 12 years, chef John Sundstrom moved Lark to a space a bit more refined, and a whole lot bigger, last year. While it now shares the 5,000 square foot building with two other concept restaurants (Bitter/Raw and Slab), it still focuses on elegant small plates, including a beloved carry over from the original location: hamachi crudo with fennel and preserved lemon. While you’ll find seafood at this third restaurant by chef Renee Ericsson – she also owns the celebrated oyster bar, The Walrus and the Carpenter – what really shines are her meat and vegetable dishes warmed in the wood-fired oven. Menu staples like roasted marrow bones and carrots, for example, become even more haunting when they’re subtly charred and smoked. Inspired by M.F.K. Fisher, this cozy spot by chef and restaurateur Ethan Stowell in Queen Anne specializes in rustic Italian small plates. Though the room airs on the snug side, it’s a lively place to be, with its wood paneling, arched ceilings, and brass accents. (It almost feels like you’re hanging in a wine barrel, a really chic one.) The pastas are exceptional, cooked al dente, and in true Fisher fashion, bumped up with just a few quality, flavor-packed ingredients.